Are you an entrepreneur or small business owner out there making things happen? Being an entrepreneur has its own set of perks and struggles that differentiate you from the pack. Being a solo business owner is more than just clocking hours and earning money – it’s a lifestyle! While it may feel like each of us is an island, the truth is there are many other business owners out there ready to advise, support, and walk alongside you on this epic journey to success. The good news is: You Are Not Alone! There are millions of sole proprietorships in America with thousands being added daily. Our challenge is that we all operate in our individual corners instead of making connections that will aid us on our path to success. What if, instead of putting on our Everything CEO hats and doing it all on our own, we worked on connecting, contributing and celebrating with other entrepreneurs and small business owners? This building and nurturing of relationships may feel like work but the return on this investment is HUGE when it comes to inspiration, motivation and feeling supported by our community. The opportunities that occur when we grow our personal network will help your business thrive: need a recommendation or vendor referral, want some advice on business strategy, have an urge to feel challenged, just need a push to get going in the right direction? A strong, supportive community of like-minded individuals is what every business owner needs to keep their business strong, healthy, and moving in the right direction! It’s tough to remember the importance of building these connections and celebrating our regular successes while we are hustling and bustling to win work and complete projects. 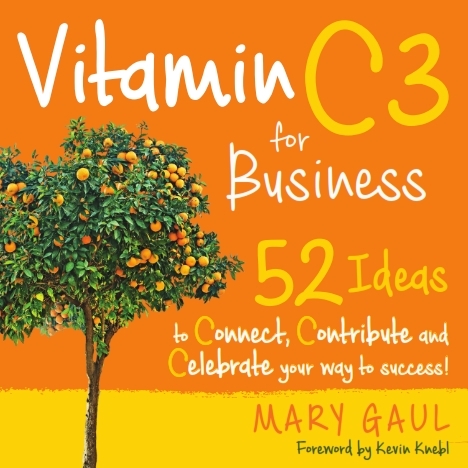 That is why I wrote Vitamin C3 For Business: 52 Ideas to Connect, Contribute and Celebrate Your Way to Success! This small book packs a BIG punch! Inside are weekly ideas and reminders on how to focus on the health of, not only your business, but your professional mindset. It’s time to show burnout the door, and remove those stumbling blocks that are keeping you from rocking your gifts. Are you excited? Ready to add more Vitamin C3 in your life to contribute to the health of your business? Want a dose of what to expect with Vitamin C3? Then we have just the treat for you! 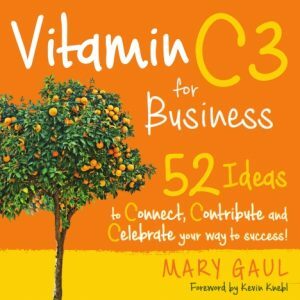 Vitamin C3 for Business: Why businesses fail, how Vitamin C3: Connect, Contribute and Celebrate can help. Watch Mary give this speech here. At the end of each day, it’s my goal to ensure that the entrepreneurs and small businesses I interact with feel supported and celebrated. YOUR success is MY success.